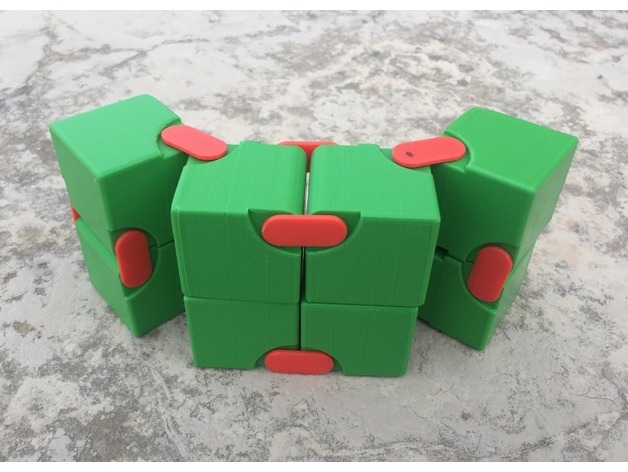 Snapping Hinged Infinity Cube, Magic Cube, Flexible Cube, Folding Cube #3DPRinting #3DThursday « Adafruit Industries – Makers, hackers, artists, designers and engineers! Igbu shared this project on Thingiverse! The magic/flexible/folding/infinity cube (or whatever fancy name you could think of) is easy to build using wooden or cardboard cubes. According to Reference 3, it was invented by Naoki Yoshimoto in 1971, which I am not absolutely sure about. In my case, I first made a huge model using 48 polydron squares and adhesive tape, just to track the symmetries of the structure. It is an appealing challenge to do it in a 3D design world. In this project, I took advantage of previous work with snapping joints. The result goes beyond my expectations. It is a bit frustrating to assemble in the beginning, as a puzzle should be. Once you get the symmetry worked out, you won’t be disappointed! Also, you could try printing in various colors and then mix and match them for an infinity cube, to further explore the symmetry of the structure. Each cube is 36mm x 36mm x36mm. There are two versions—the regular version with rounded joints and a loose version that allows more room to maneuver. Both versions came out well on my Flashforge Creator Pro. Please try the halves if your printer bed is not big enough.